Gotta try at least one new ice cream recipe this summer. Have you ever seen fields of lavender? When we were in France several years ago I was disappointed that we didn’t get to see fields of purple; but we were there too early in the year. I have seen fields of lavender in Texas at Becker Vineyards and also at Matanza Creek in Santa Rosa, California which were both breathtaking. Since purple is one of my favorite colors I wanted to try some using some culinary lavender I had bought in Austin awhile back. I was taught years ago in school that you don’t use artificial coloring in food (I think the exception has to be decorated cookies and cakes). Green should never be used in Key Lime Pie. You know that PURPLE is my favorite color (have I said this before???). 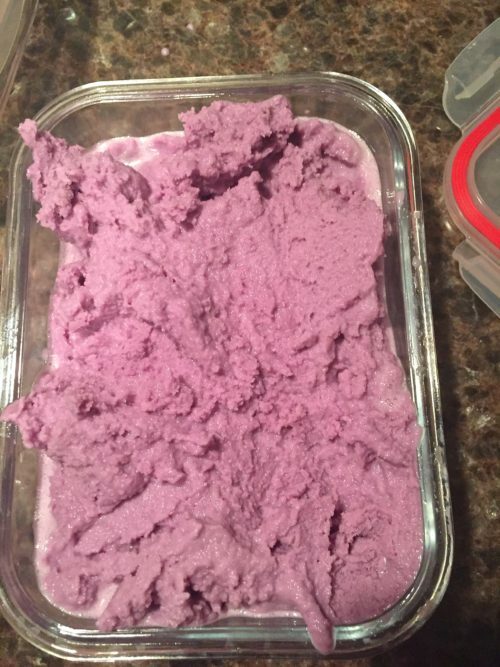 So how am I making my purple ice cream then if I can’t use that little bottle of purple food coloring I have that I use for cookie frosting — blueberries, of course. 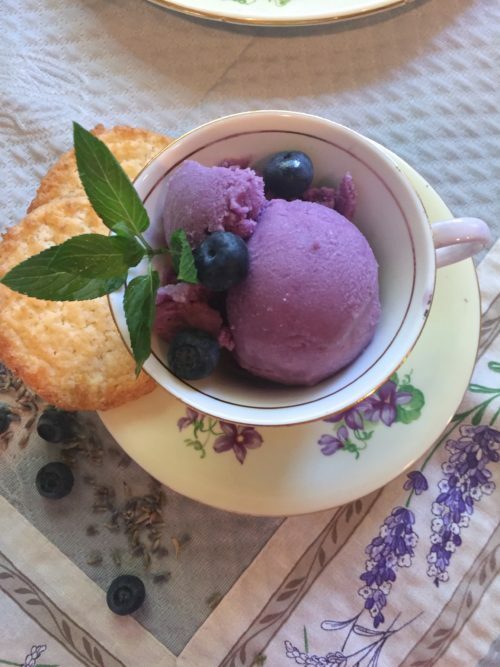 Have you tried any new ice cream recipes this summer? And have you tried my Coconut Almond Ice Cream, coconutty, chocolate and oh so good. 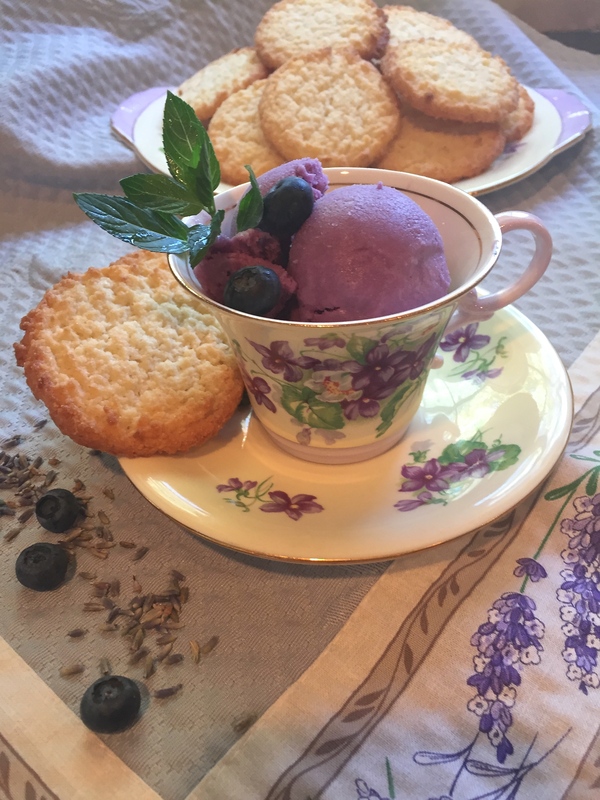 And, after you try that one, try my newest one which is this Blueberry Lavender Ice Cream. I’ve learned over the years that you can put absolutely anything in your ice cream and you will probably love it. Since I’m justing coconut milk as one of the three milks in this ice cream, I’m serving some “store bought” coconut cookies. I can’t wait for guest to try it. Either they will like the lavender or they won’t. I will love looking and scoops of purple ice cream garnished with some “green” mint leaves for sure. BLAST FROM THE PAST: I just posted this Buttermilk Ice Cream with Bourbon Peaches recipe last year. I do wish you would try it. The buttermilk adds a little tartness. 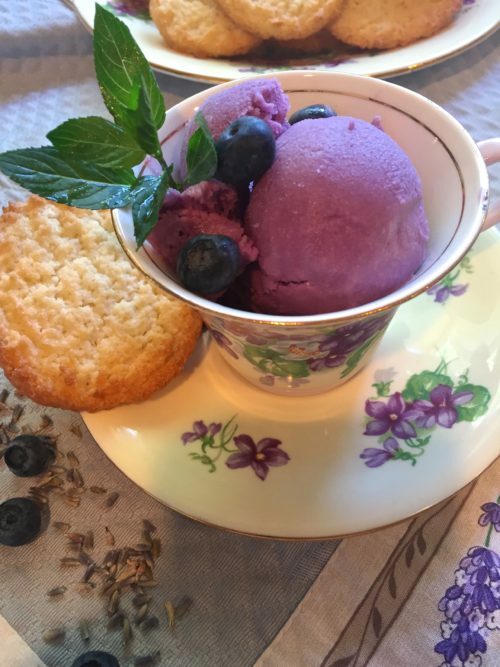 Love this blueberry ice cream. You can use all are some of these milks. I wouldn’t use all coconut milk though because there’s no fat and the ice cream would probably freeze too hard. 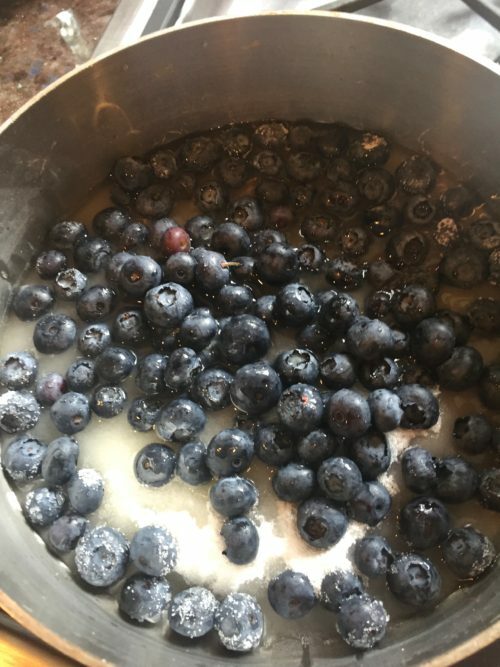 Put the blueberries, lemon juice, water and sugar in small saucepan and cook until berries pop. 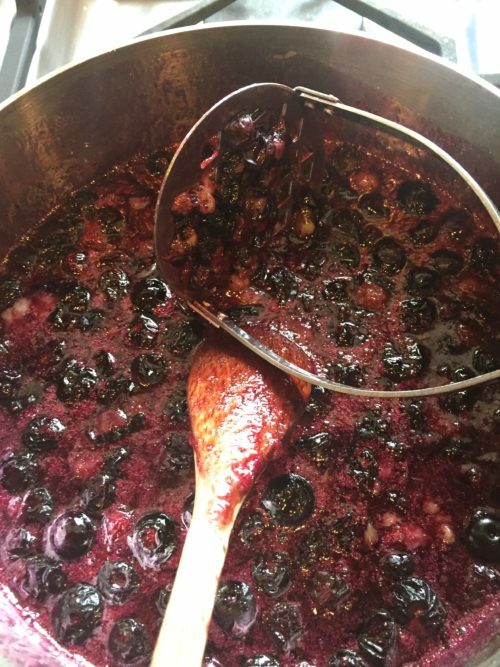 After the blueberries pop and the sugar has dissolved use a potato masher and mash up the berries. Strain the berries and discard pulp and skins of berries. Put the three milks in saucepan and add the lavender. Bring to barely a simmer and then turn off heat and let steep for about 15 minutes then strain through sieve to remove lavender buds. Mix the milk and the blueberry mixture and chill several hours or overnight in refrigerator until very cold. 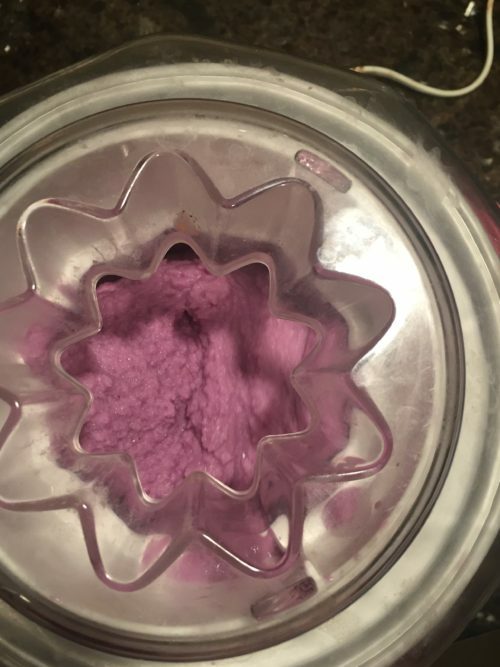 Pour the mixture into your ice cream freezer and freeze until firm then pour into freezer safe container and freeze for several hours before serving. Let sit out for about 5 minutes before scooping. Garnish with some blueberries, mint leaves and serve some coconut cookies along side. Put the rinsed blueberries, lemon juice, water and sugar in a small saucepan. 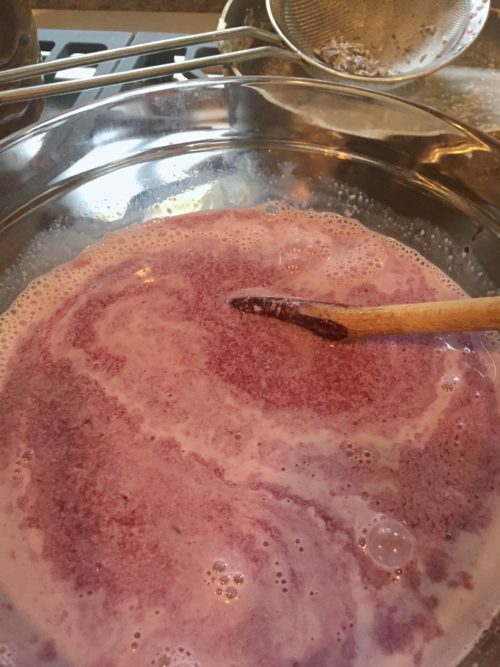 Bring to a boil and cook until berries start popping and sugar is dissolved, 7-8 minutes. 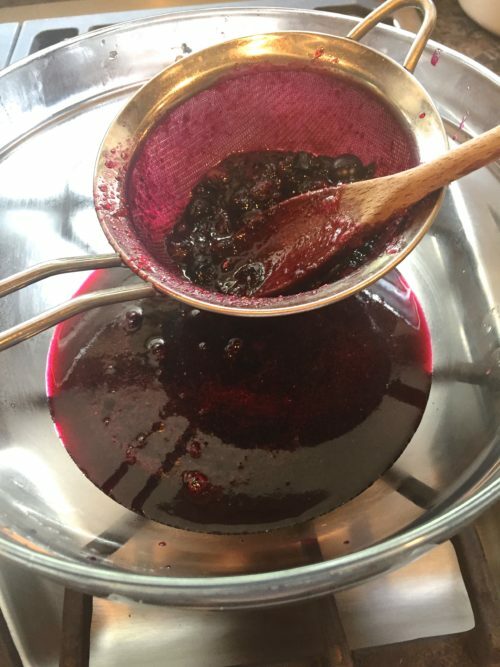 Remove from heat, mash with a potato masher then strain through a sieve to separate all the berry skins. Set Aside. Put the coconut milk, Half & Half, and whole milk in a small saucepan. Add in the 2 teaspoons of lavender buds and bring to a bare simmer. Turn off heat and let steep for about 15 minutes. 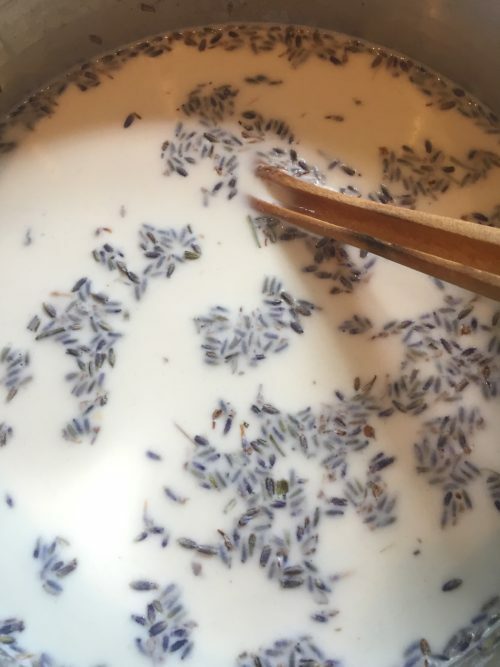 Pour the milk through a sieve to remove the lavender buds. Stir in 1 tsp. vanilla extract. Mix the blueberry mixture and the milk mixture together and chill until very cold. Pour into your ice cream machine and make according to directions for the machine. Mine machine usually takes about 20 minutes. Pour the ice cream up into freezer proof containers and freeze for several hours or overnight before serving. Scoop up, garnish with mint leaves and some extra blueberries. If you like, serve some coconut cookies along side the dish of ice cream. 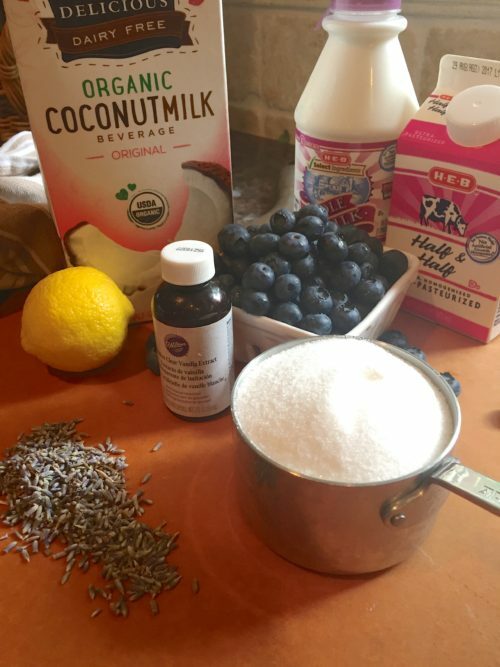 You can use all coconut milk or no coconut milk and substitute whatever other milk you want to use.